We had spent well over a hundred dollars on sequins and tulle sewn onto a tiny little leotard. Sure, we'd be taking the purple, frothy costume with us when we moved, but Abby would miss the recital for which we'd purchased the get-up. This little Rockin' Robin wouldn't be rockin' with all the other little robins that she had finally begun to enjoy tumbling and tapping her feet and pointing her toes with. And this mama bird was put out about it. I'd already checked, and there wasn't a ballet studio for miles around the little town where we were moving. After eight months of me brushing Abby's long, tangled hair into a tight bun, pulling those pink tights over her chubby and uncooperative little legs, and bribing her with promises of ice cream in order to get her out of the car at the dance studio, we were leaving behind my dreams of Abby's career as a ballerina. She couldn't have cared less. But I was put out. When we move from one place to another we always leave something behind. Sometimes we gladly leave behind heartache and stressful situations and financial problems and mean people. We're glad to get out of Dodge. Other moves are more difficult. We're going where we must go, where God has called, where the military has assigned, where the new job is or where family needs us. But even though we know we must go...and we're even excited or at least accepting of it...the move takes a toll. Even if we're anticipating good things ahead, good things wave goodbye in our rearview mirror, too. And yes, I know what it feels like to leave behind hopes and dreams and plans. Not just dreams of ballet recitals, although those are important and emotional enough to elicit a few tears. But I've left behind dreams of watching your friends' kids grow up, of sharing holidays with family, of living in that dream home you built, of growing with your church family and of building onto the friendships you've invested so much in. I can empathize. But I can also encourage. You see, I've known the pain of leaving behind good schools and a classical ballet instructor and a gracious piano teacher and dear, precious friends and a good church and vibrant memories and big plans and so many other sweet, sweet things. But I've also known the peace that God provides when you open your tightly gripped hands and hold all of those blessings loosely and allow your gracious God to change them up a little. Let's face it. I knew Abby was never going to be a ballerina. And sure enough, while a little dance studio did eventually open in the little town we had moved to, it was never of the same quality as the one she'd left behind. But when I finally quit scouring the phone book for dance studios in a 60 mile radius and released that dream, I found that God had other things in store for my daughter in that little East Texas town. She played T-ball and took piano lessons and rode her bike to school and played kickball with the kids down the street until the sun set every evening. In fact, 15 years later mind you, Abby still keeps in touch with those same kids, even though we moved to another state ten years ago and she rarely sees them in person. We pried open our hands and opened our hearts, too. Our sovereign, loving God removed a classically trained dance teacher and replaced her with three of the sweetest lifelong friends you could ever ask for your daughter to have. Some blessings are for a season, you see. Others are for a lifetime. But if you grip any of your blessings in greedy hands, you'll never really know what others you may have missed. In my friend Susan Miller's book After the Boxes are Unpacked, she encourages people who are on the move to "cherish, not cling," to most things. Sure, she says to cling to God, your Bible, your faith, prayer, and your immediate family with whom you're making the move. But she warns that if you cling to the things in your rearview mirror - the friends and family you're leaving behind, memories, your heritage, your old job, the house you loved or your roots - you'll struggle to move forward into what God has in store for you. You may very well miss out on some of His richest blessings. Sometimes it helps just to know someone else feels your pain. Friend, I do. It hurts to leave and lose and let go. But, just like you're mama promised when she ripped that bandage off your knee when you were seven, I'm telling you that if you'll open your clenched fists and hold them up to your gracious God...the pain will be fleeting and the joy will soon return. You can let go because you can trust God. PS - I read Susan's book After the Boxes are Unpacked during two moves. And if I ever move again, I'll definitely read it again! This is a great resource for those of you packing up and heading off! 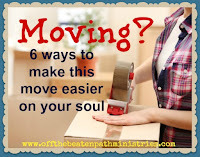 What dear thing or person or dream have you struggled with leaving behind during a move?